Today is International Cooperative Day – a holiday that has been celebrated by the International Cooperative Alliance for the past 88 years, and has more recently been recognized by the United Nations. Despite this, the holiday gets almost no attention in the US (I had forgotten it myself until a chance conversation today). In a quick search, I wasn’t able to find one mention of it in any US news outlet, nor did I find mention of UN Secretary-General Ban Ki-moon’s message about the holiday. So what is a cooperative? According to Wikipedia, it is “a business organization owned and operated by a group of individuals for their mutual benefit.” There are lots of types of cooperatives, many of which are found throughout the US: food co-ops, housing co-ops, worker co-ops, marketing co-ops, farmer co-ops, parenting co-ops, and many others. The New York Times even just published a great article on a recent trend of cooking co-ops. Outside the US, cooperatives are even more pervasive. The Mondragon Corporation, located in the Basque region of Spain, is a federation of worker cooperatives that operates 256 companies and employs over 92,000 people. Last year, Mondragon and the United Steelworkers announced plans to open a cooperative in the US. It seems like the time has come to give cooperatives their due in the US. I’m sure you’ll be hearing much more about them soon, since the United Nations declared 2012 the International Year of Cooperatives as part of the Millennium Development Goals. Cheeseboard Collective (Berkeley, CA) – Today’s pizza: Roma tomatoes, onions, mozzarella and Danish blue cheese, garlic olive oil, Italian parsley. Yum! So, go out and celebrate International Cooperative Day and support your local co-ops! Nick – I found the site because my Flickr picture pointed to it. (Don’t forget to attribute!) Glad the great idea of Co-opearation is still alive in the USA. The principles and benefits are all still there staring at us, and when we stop borrowing from the future and stop worshipping supinely those megalithic institutions which do so heavily, the answer lies herein. My grandfather (b 1879) is fourth coat from the left – all done in his spare time for the greater good. All his relatives left for the USA in the early 1900s except him. One problem is that the Co-operative movement made the people richer, being more of a closed system, and unfortuately they took the money and became selfish , following the morality-light cause, seduced by businesses where the bottom line was price at any cost . Who knows what is ahead though? Felix – Thanks for the comment! 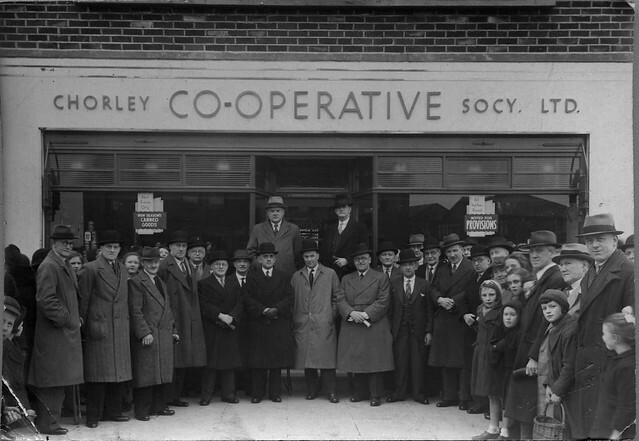 The photo is a great image that really captured the history of the cooperative movement.